Light, tangy and a little spicy! This One-Pot Orecchiette Pasta is perfect for Spring or Summer...and you only use one pot! 1. Heat the olive oil in a large deep skillet or a Dutch oven over medium heat. Add the chicken sausage and chopped fennel. 2. Break apart sausage with a wooden spoon, until well-browned. 3. Add the minced garlic, black pepper, salt and red pepper flakes. Cook over medium heat for 1 minute, stirring frequently. 4. Add white wine and let boil for 3 minutes. 5. Add chicken broth and bring to a boil over high heat. 6. Stir in lemon juice and capers. 7. Add orecchiette pasta and let cook over medium heat for 4 minutes. 8. Add the asparagus and let cook for 10 minutes or until the pasta is al dente and the asparagus is tender. 9. Remove from heat. Transfer to a serving dish and sprinkle with Pecorino Romano cheese. Heat the olive oil in a large deep skillet or a Dutch oven over medium heat. Add the chicken sausage and chopped fennel. 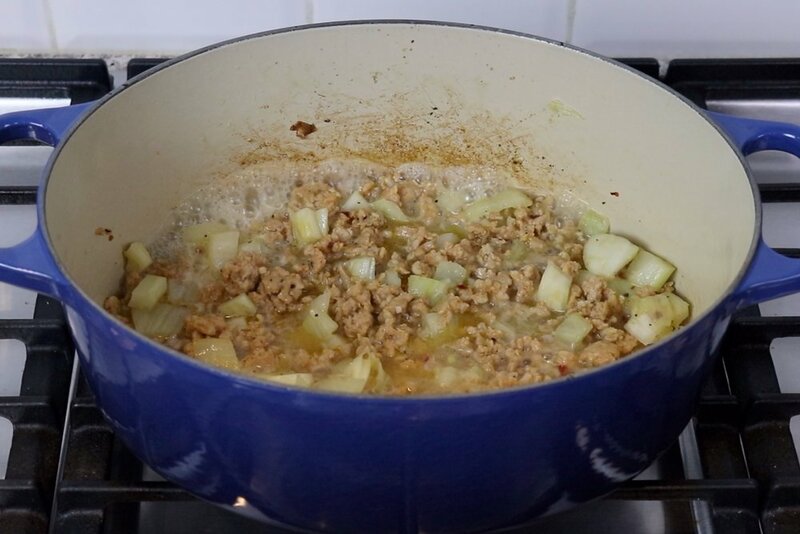 Break apart sausage with a wooden spoon for around 5 minutes or until browned. Add the minced garlic, black pepper, salt and red pepper flakes. Cook over medium heat for 1 minute, stirring frequently. Add white wine. Bring to a boil and let wine cook off for 3 minutes. Add chicken broth and bring to a boil over medium high heat. Stir in lemon juice and capers. Add orecchiette pasta and let cook over medium heat for 4 minutes. Add the asparagus and continue cooking for 10 minutes or until the pasta is al dente and the asparagus is tender. Remove from heat. Transfer to a serving dish and sprinkle with Pecorino Romano cheese. *You can use Parmesan cheese with this recipe as well. *This recipe will also work with pork sausage.